Truck mount steam cleaning in Bothell, WA is becoming a very popular way of steam cleaning carpets in both commercial and residential properties. The water is heated to the temperature needed to create the steam in the truck, and the technician will use a cleaning wand that is connected to a hose to clean your carpets. Steam cleaning is one of the most effective ways of cleaning your carpets and can give them a truly deep clean. There are a number of benefits of using Bothell, WA truck mount steam cleaning in your property. It is suitable for properties of all sizes as the hose can often extend as far as you need it. This makes it particularly effective for commercial premises that cover a large area. When cleaning is carried out from the truck mount it keeps all of the equipment outside which means you have no need to worry about chemicals that are used for cleaning being spilled in your property. 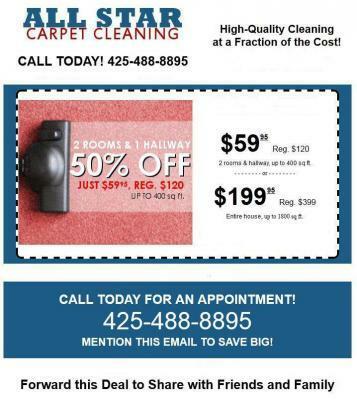 It is also a very efficient way of cleaning your carpets as there is hardly any set up and clean up needed. When the technician visits your property in the truck, he is ready to start cleaning almost immediately and when he is finished there is virtually no equipment to have to put away. Our staff are fully trained in the latest truck mount steam cleaning techniques in Bothell, WA and we also make use of state of the art machinery in order to ensure that we offer you the very best steam cleaning experience. Giving your carpets this type of clean will not only help them to look better but also makes your home and office more hygienic. Contact us for more information about the services that we offer.